Erin Christovale is the Assistant Curator of the Hammer Museum, whose Made in L.A. biennials generate art world buzz that extends well beyond the bounds of the Golden State. She’s the co-founder of Black Radical Imagination, which champions short films that challenge typical representations of black characters in entertainment. And, if lists are your thing, she’s been named one of the 10 most influential young curators to watch. Free time is not something Erin has a lot of, but she paused to shed some light for us on her vision as a curator and why L.A. is such a dynamic place for art right now. Kristina Feliciano: While Made in L.A. 2018 is far from your first curatorial project, it’s arguably the most high profile. What do these acclaimed biennials mean to Los Angeles, and what did working on it mean to you? Erin Christovale: Yes. Working on Made in L.A. 2018 marked a really important transition in my curatorial practice and life. This project was a massive undertaking that required a level of commitment I hadn’t experienced before and really forced me to grow. It was also really important to me because I’ve practically lived here my entire life so the pressure to deliver a biennial that was both topical and truly reflected the city in all its histories, communities, artists and socio-political issues was high. Ultimately, I wanted to create something that felt like a love letter to Los Angeles and I feel like we (Anne Ellegood, my co-curator, and I) accomplished that. Made in L.A. as an ongoing biennial is important to Los Angeles because it affirms the fact that this city has a thriving artistic community that’s entirely its own and that doesn’t need to be compared to or defined by New York. 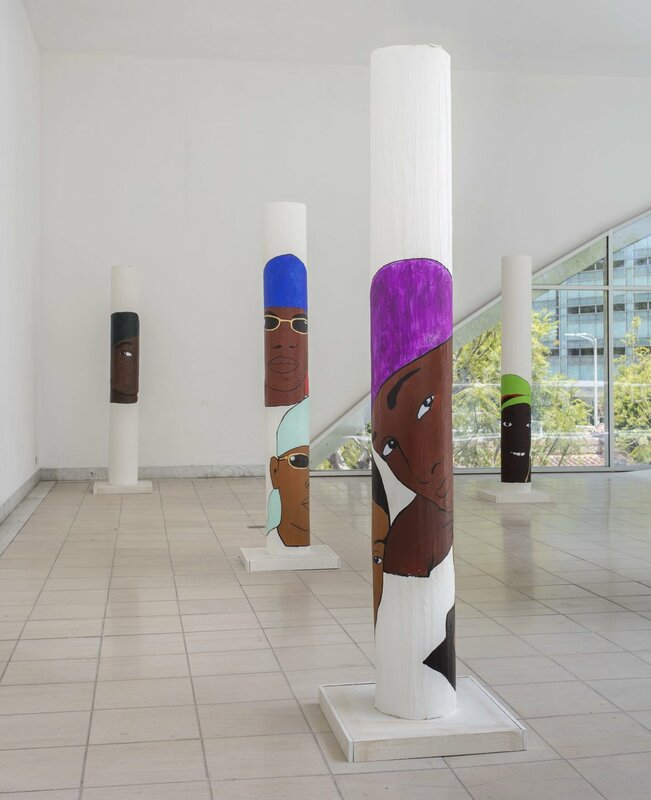 "Made in L.A. as an ongoing biennial is important to Los Angeles because it affirms the fact that this city has a thriving artistic community that’s entirely its own and that doesn’t need to be compared to or defined by New York." For Made in L.A. 2018 you visited more than 200 artist studios in the city. What are some of your observations from those experiences? The one thing that really resonated with me is that artists are such resilient people. They are constantly pushing up against so much and considering the rapid rate of development in the city in recent years, so many artists are having to leave their studios and find alternative spaces to work because of rent increases and overall displacement. You’ve talked about having used social media as a source of artists when you were putting together Made in L.A. 2018. Which accounts should we be immediately adding to our feeds? Yes, it’s the quickest way to see what artists are up to and new work in process . Some of my favorite accounts right now are Kohshin Finley, an L.A. painter who creates beautiful grisaille portraits of his community, Antoine J. Girard , who gives the best tours at The Broad and is always on the scene posing in front of his favorite work, Vivian Crockett, a Ph.D candidate and radical art worker based in NY who’s always keeping me up to speed on queer/afro/latinx artists and Naima Keith the Deputy Director of the California African American Museum in L.A. and such an inspiration! L.A.’s art scene is flourishing. What are some of the noteworthy changes you’ve observed both as an L.A. native and a curator, in terms of the art scene itself and L.A.’s status as a center for art? Yes, there was a moment in time when I could attempt to see every show in the city over a weekend. That’s impossible now. There are galleries, artist-run spaces, museums and DIY creative spaces everywhere. The city has exponentially grown in the past few years and it feels like the art community is leading the charge. I think the growth of a city, specifically in the creative sector, comes with its pros and cons. I am so excited to discover new spaces and artists but I am also aware of the communities and histories that may be on the margins of this movement. "I am so excited to discover new spaces and artists but I am also aware of the communities and histories that may be on the margins of this movement." You once said in an interview that you are “very particular about working with artists of color, queer artists, and emerging artists.” Can you expand on this? Yes, and I hold myself to that. If someone were moving to L.A. from, say, New York City and wanted to immerse themselves in the L.A. art scene, where would you direct them, apart from the major museums and galleries? I would direct them to the historical art spaces of this city in order to provide a framework for where we are now and how we got here. The William Grants Still Art Center, The Watts Towers Art Center, The Vincent Price Museum, The Los Angeles Municipal Arts Gallery, & Gemini G.E.L.